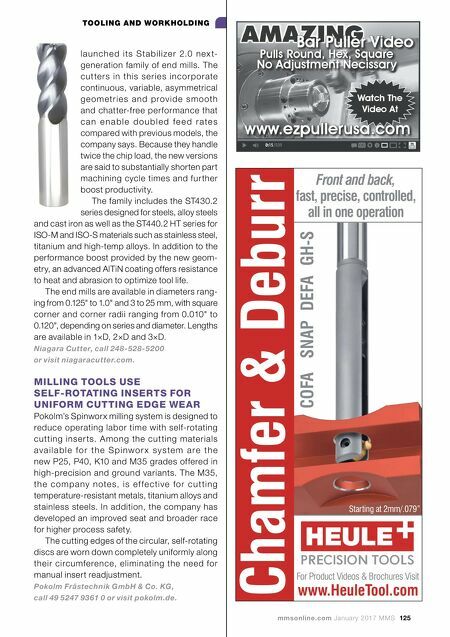 mmsonline.com January 2017 MMS 125 TOOLING AND WORKHOLDING Chamfer & Deburr COFA SNAP DEFA www.HeuleTool.com For Product Videos & Brochures Visit GH-S Front and back, fast, precise, controlled, all in one operation Starting at 2mm/.079" l a u n c h e d i ts S t a b i l i ze r 2.0 n ex t- generation family of end mills. The cut ters in this serie s incorporate continuous, variable, asymmetrical g e o m etr i e s a n d p rov i d e s m o oth and chatter-free per formance that c a n e n a b l e d o u b l e d f e e d r a t e s compared with previous models, the company says. 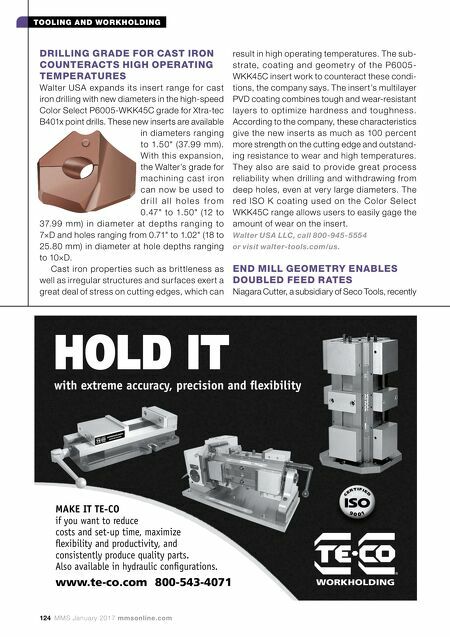 Because they handle twice the chip load, the new versions are said to substantially shorten part machining cycle times and fur ther boost productivity. The family includes the ST430.2 series designed for steels, alloy steels and cast iron as well as the ST440.2 HT series for ISO-M and ISO-S materials such as stainless steel, titanium and high-temp alloys. In addition to the performance boost provided by the new geom- etry, an advanced AlTiN coating offers resistance to heat and abrasion to optimize tool life. The end mills are available in diameters rang- ing from 0.125" to 1.0" and 3 to 25 mm, with square corner and corner radii ranging from 0.010" to 0.120", depending on series and diameter. Lengths are available in 1×D, 2×D and 3×D. Niagara Cutter, call 248-528-5200 or visit niagaracutter.com. MILLING TOOLS USE SELF-ROTATING INSERTS FOR UNIFORM CUTTING EDGE WEAR Pokolm's Spinworx milling system is designed to reduce operating labor time with self-rotating cut ting inser ts. Among the cut ting materials a v a i l a b l e f o r t h e S p i n w o r x s y s te m a r e t h e new P25, P40, K10 and M35 grades offered in high-precision and ground variants. The M35, th e c o m p a ny n ote s, i s e f fe c ti ve fo r c u t ti n g temperature-resistant metals, titanium alloys and stainless steels. In addition, the company has developed an improved seat and broader race for higher process safety. The cutting edges of the circular, self-rotating discs are worn down completely uniformly along their circumference, eliminating the need for manual insert readjustment. Pokolm Frästechnik GmbH & Co. KG, call 49 5247 9361 0 or visit pokolm.de.